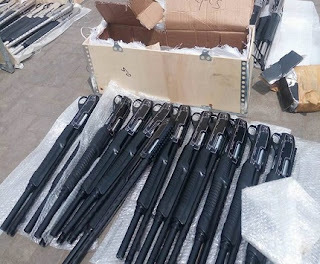 The Federal Capital Territory Police Command has arrested three suspects after discovering an illegal firearms factory in Shenagu Village, the News Agency of Nigeria reports. The FCT Commissioner of Police, Sadiq Bello, identified the suspects as Philip John, who allegedly owned the factory; Onyegabueze Okpara, the supplier of ammunition; and Joseph Bulus, the distributor. The CP told journalists that a fabricated revolver pistol cylinder, four Dane guns, one double-barrelled gun, one single-barrelled gun, two live cartridges and six Dane gun muzzles were recovered from the suspects. Also recovered were four single-barrelled muzzles, six gun frames, two gun muzzle springs, one manual motor drill and various tools used in the making of weapons. According to Bello, John confessed during interrogation that he had been in the business for 17 years. He allegedly sold single-barrelled guns for N20,000 each and Dane guns for N10,000 each. It was learnt that Okpara, who had disguised as a bicycle spare parts dealer, was arrested with the items at Kaita market and suspected to be planning to sell them to criminals. Okpara reportedly told the police that he had been in the business since 1997. He reportedly confessed that a pack containing 25 pieces of live cartridge was sold for N12,000, while single cartridges were sold for N500 each.